The much-anticipated annual highlands music festival ​Good Vibes Festival​ will return on July 21st and 22nd at ​The Ranch ​located in Gohtong Jaya, Genting Highlands. The organisers have added two stellar artists to complete announces its final lineup, rounding up the list of acts to complete 2018’s massive lineup. The two talents include Grammy-nominated R&B songstress SZA ​and critically-acclaimed American rapper ​Vince Staples. 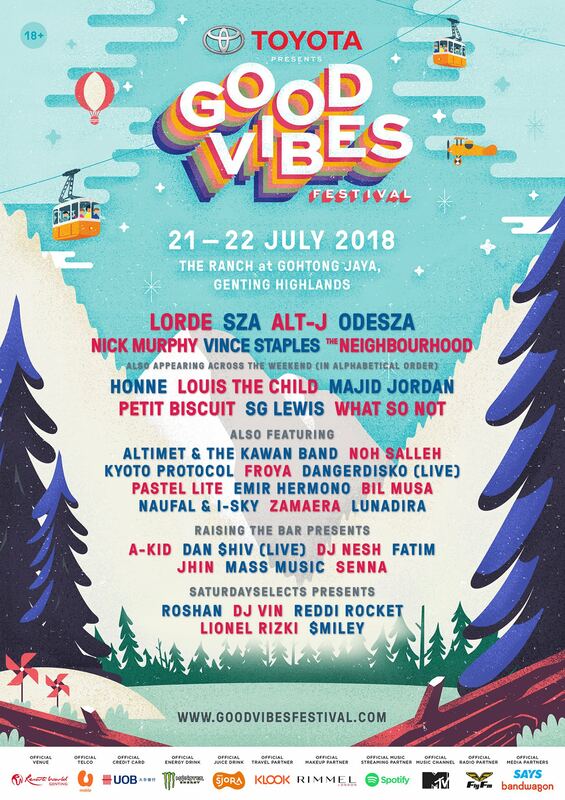 The two will join previously announced acts including the likes of New Zealand’s indie star Lorde, British indie rockers alt-J, American pop band The Neighbourhood, Australian singer and songwriter, Nick Murphy fka Chet Faker, electronic music duo ODESZA, Drake protégés Majid Jordan, British-born multi-instrumentalist and producer SG Lewis. The people behind Good Vibes have also revealed that the festival will go cashless for the first time with the introduction of RFID payment cards by ​pouchNATION​ for all on-ground transactions. “We are very excited for this year’s Good Vibes Festival as it is by far, the best and biggest yet,” said founder and director of Future Sound Asia, Ben Law. “From our amazing lineup of artists to the introduction of the VIP experience and going cashless, we want to give festival-goers an even better experience than the last. Hopefully Good Vibes Festival will continue to be the go-to event that everybody looks forward to every year,” he continued. Get your tickets to Good Vibe Festival here. Check out the full festival lineup below.